Many people are surprised to find out that the German Shepherd was originally bred for herding sheep and cattle instead of working as a guard dog, police dog or pet. The German Shepherd does not have the "eye" of a border collie. Their instinct is to patrol a boundary all day and restrict cattle from entering or leaving the designated area. This instinct makes the breed superb guard dogs who will protect their herd or family from harm. The powerful, well muscled German Shepherd is sensible, very intelligent, quick to learn, loyal and protective of home and property. It's weather resistant double coat can be either short or long haired. It varies in color, mostly shades of cream and brown, but also sable, black or white. 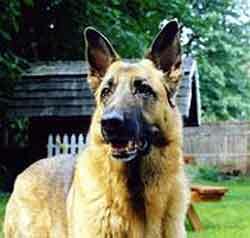 The German Shepherd has become one of the most world's most widely recognized breeds. A large dog, the males weigh 65 to 85 pounds and are 24 to 26 inches at the withers. The slightly smaller females weigh 50 to 70 pounds and stand 22 to 24 inches.